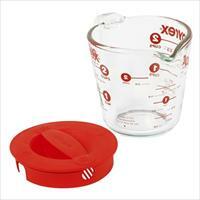 8-Cup Clear Measuring Cup with Red Cover. Glass is Oven, Microwave, Frig/Freezer, Dishwasher safe . Non-porous glass won't absorb odors, flavors or stains. Non-porous glass,won't absorb food odors, flavors or stains. 4-position lid allows you to sift, pour, strain and sprinkle. Sure fit seal keeps lid secure while pouring. Made in the U.S.A.. 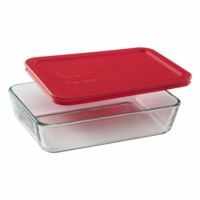 Overall dimensions: 5.125" H x 4.75" W x 6.5" D.
6 Cup Rectangular Dish w/ Red Lid. Dishwasher, refrigerator, microwave, freezer & pre-heated oven safe. Non-porous surface does not absorb food odors, flavors or stains. Pyrex® glass proudly made in the USA. 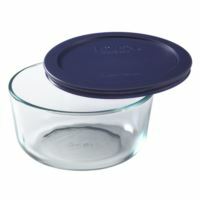 2 Year Limited Warranty on Pyrex® glass and lids. 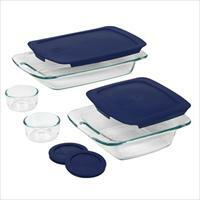 (2) 1.9-Cup & (1) 1.2-Qt Storage Dishes, Lids. Glass is Oven, Microwave, Frig/Freezer, Dishwasher safe. Non-porous glass won't absorb odors, flavors or stains. Clear glass allows you to watch your food as it cooks. 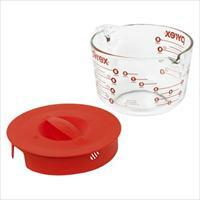 Set includes 1-each: 2-cup Round Dish, 4-cup Round Dish, 7-cup Round Dish, Red Plastic Covers. Dishwasher, refrigerator, microwave, freezer & pre-heated oven safe. Non-porous surface does not absorb food odors, flavors or stains. Pyrex® glass proudly made in the USA. 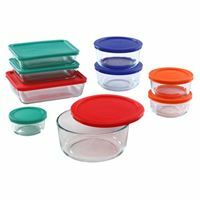 2 Year Limited Warranty on Pyrex® glass and lids. 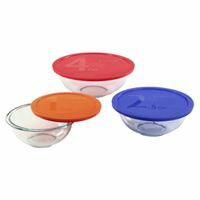 Includes 4-Qt Mixing Bowl, Red Plastic Cover, 2.5-Qt Mixing Bowl, Blue Cover, and 1.5-Qt Mixing Bowl, Orange Cover. Made of nonporous glass that won't warp, stain, or absorb odors. Glass is preheated oven, microwave, fridge, freezer & dishwasher safe. Lids are BPA free and top-rack dishwasher safe. Pyrex Glass is Made in the USA and comes with a 2 Year Warranty. 1Qt, 1.5Qt, 2.5Qt and 4Qt nesting bowls. 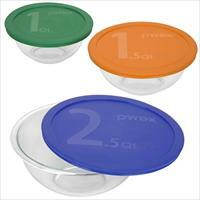 Each bowl includes a lid with size indicator. Glass is Oven, Microwave, Frig/Freezer, Dishwasher safe. Non-porous glass won't absorb odors, flavors or stains. Clear glass allows you to watch your food as it cooks. 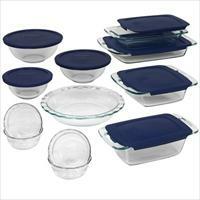 Set includes: 4-cup round dish with blue plastic lid, 3-cup rectangular dish with green lid, 6-cup rectangular dish with red lid & two 2-cup round dishes with orange lids. Dishwasher, refrigerator, microwave, freezer & pre-heated oven safe. Non-porous surface does not absorb food odors, flavors or stains. Pyrex® glass proudly made in the USA. 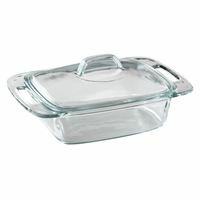 2 Year Limited Warranty on Pyrex® glass and lids. 3-qt Oblong, 8" Square, Red Plastic Covers. Glass is Oven, Microwave, Frig/Freezer, Dishwasher safe. Non-porous glass won't absorb odors, flavors or stains. Clear glass allows you to watch your food as it cooks. 2-Qt & 3-Qt Oblongs. 8" Square, 1.5-Qt Loaf, plastic covers. 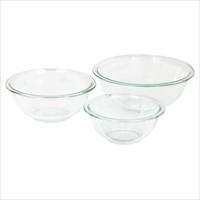 1, 1.5 & 2.5-Qt Mixing Bowls, covers. 9.5" Pie Plate, (4) 10oz Custard Cups. Glass is Oven, Microwave, Frig/Freezer, Dishwasher safe. Non-porous glass won't absorb odors, flavors or stains. Clear glass allows you to watch your food as it cooks. 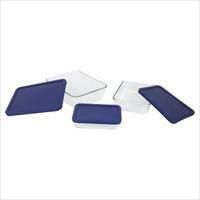 3-Qt Oblong, 8" Square, Plastic covers. 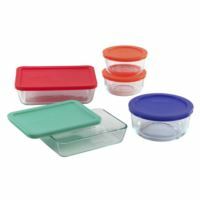 (2) 1-Cup Storage Dishes, Covers. Glass is Oven, Microwave, Frig/Freezer, Dishwasher safe. Non-porous glass won't absorb odors, flavors or stains. Clear glass allows you to watch your food as it cooks. 3-Qt Oblong, Plastic cover. 2-Qt Oblong, 8" Square, 1.5-Qt Loaf. Glass is Oven, Microwave, Frig/Freezer, Dishwasher safe. Non-porous glass won't absorb odors, flavors or stains. Clear glass allows you to watch your food as it cooks. 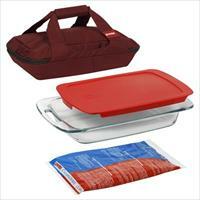 3Qt Easy Grab oblong, red cover, large unipack, red carrier. Perfect for transporting food to parties and picnics. Glass is Oven, Microwave, Frig/Freezer, Dishwasher safe. Non-porous glass won't absorb odors, flavors or stains. Clear glass allows you to watch your food as it cooks. 3Qt Easy Grab oblong, red cover,large unipack, black carrier. Perfect for transporting food to parties and picnics. Glass is Oven, Microwave, Frig/Freezer, Dishwasher safe. Non-porous glass won't absorb odors, flavors or stains. Clear glass allows you to watch your food as it cooks. 3Qt (9x13") Easy Grab oblong; large unipack, red cover. 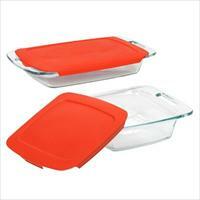 (2) 6-Cup rectangular storage dishes, red covers. Black insulated carrier. 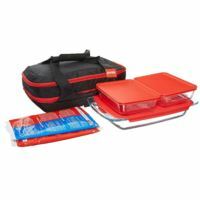 Perfect for transporting food to parties and picnics. Glass is Oven, Microwave, Frig/Freezer, Dishwasher safe. Non-porous glass won't absorb odors, flavors or stains. Clear glass allows you to watch your food as it cooks. 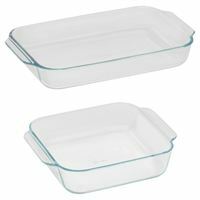 3-Qt and 2-Qt Clear Oblong Glass Baking Dishes. 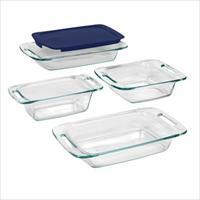 Clear, nonporous Pyrex glass won't stain or absorb odors. Safe for oven, microwave, freezer, and dishwasher; made in USA. Measures 13in x 9in and 11in x 7in. Pyrex Glass is Made in the USA and comes with a 2 Year Warranty. (2) 2-Cup Round, Orange Lids; (2) 4-Cup Round, Blue Lids; 1-Cup Round, Green Lid. 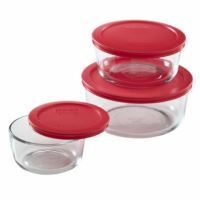 (2) 3-Cup Rectangle, Green Lid; 6-Cup Rectangle, Red Lid, 7-Cup Round, Red Lid. Pyrex Glass is Made in the USA and comes with a 2 Year Warranty. 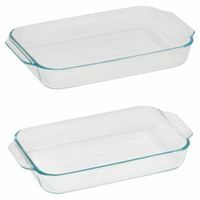 2-Qt and 3-Qt Oblong baking dishes. Non-porous glass won't absorb stains or odors. Oven, microwave, fridge, freezer and dishwasher safe. 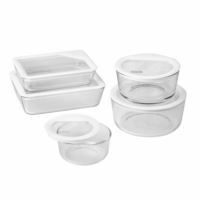 Set Includes 1 each: 7-cup round bowl, 6-cup rectangle storage, 4-cup round Bowl, 3-cup and 2-cup round bowl with oven safe glass lids with white silicone rims. Dishwasher, refrigerator, microwave, freezer & pre-heated oven safe. Non-porous surface does not absorb food odors, flavors or stains. Pyrex® glass proudly made in the USA. 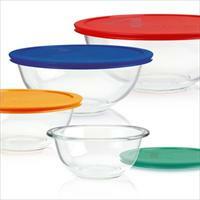 2 Year Limited Warranty on Pyrex® glass and lids. 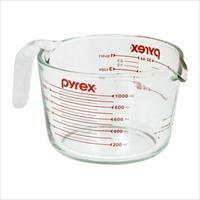 2-cup Measuring Cup, Red Graphics, Clear. Made of nonporous glass that won't warp, stain, or absorb odors. Glass is preheated oven, microwave, fridge, freezer & dishwasher safe. Pyrex Glass is Made in the USA and comes with a 2 Year Warranty. 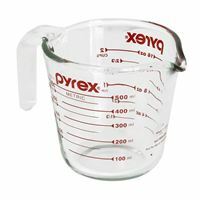 4-Cup Clear Measuring Cup . Glass is Oven, Microwave, Frig/Freezer, Dishwasher safe . Non-porous glass won't absorb odors, flavors or stains. 3, 6 and 11-Cup rectangular, blue plastic covers. Glass is Oven, Microwave, Frig/Freezer, Dishwasher safe. Non-porous glass won't absorb odors, flavors or stains. Clear glass allows you to watch your food as it cooks. 2, 4 and 7-Cup rounds, blue plastic covers. Glass is Oven, Microwave, Frig/Freezer, Dishwasher safe. Non-porous glass won't absorb odors, flavors or stains. Clear glass allows you to watch your food as it cooks. 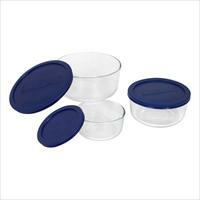 4 Cup Round Dish w/ Blue Lid. Dishwasher, refrigerator, microwave, freezer & pre-heated oven safe. Non-porous surface does not absorb food odors, flavors or stains. Pyrex® glass proudly made in the USA. 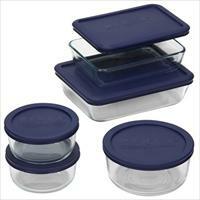 2 Year Limited Warranty on Pyrex® glass and lids. 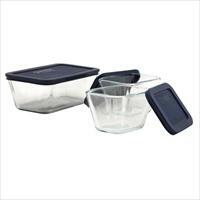 3.5 & 6-Cup rectangular, 4 and (2) 2-Cup round bowls, lids. Glass is Oven, Microwave, Frig/Freezer, Dishwasher safe. Non-porous glass won't absorb odors, flavors or stains. Clear glass allows you to watch your food as it cooks. Set includes one each: 1-cup, 2-cup and 4-cup measuring cups. Dishwasher, refrigerator, microwave & pre-heated oven safe. Non-porous surface does not absorb food odors, flavors or stains. Proudly made in the USA. Set is packaged in plain brown box. 2 Year Limited Warranty on Pyrex® glass.